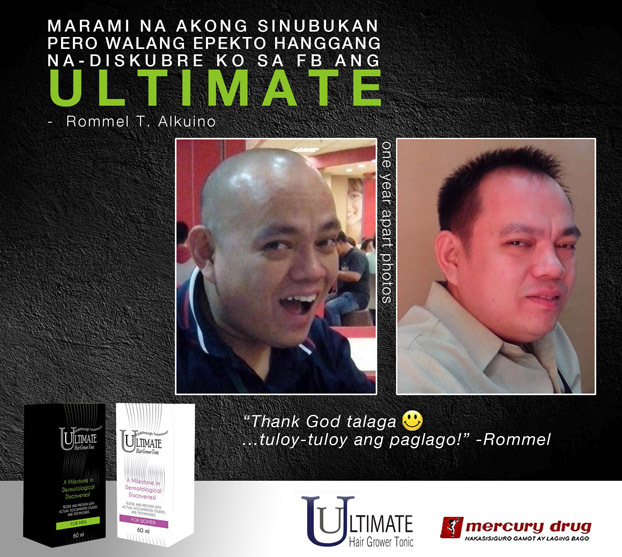 Many things changed in my life since I read in Manila Bulletin your advertisement and started using Ultimate. Now I believe in myself more. Before sinubukan ko ang isang kilalang brand sa drug store at pagkatapos yun namang nasa TV. A doctor even injected something on my scalp pero wala ring nangyari. Kamukha ko daw si Atoy Co noon sabi nila. 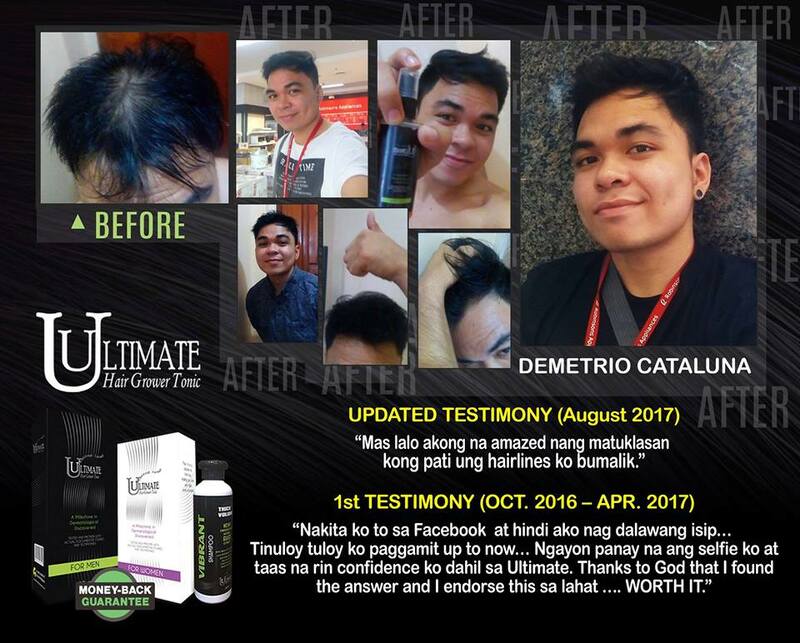 Sayang nga lang at marami nang nawala sa buhok ko bago ko nalaman ang Ultimate. 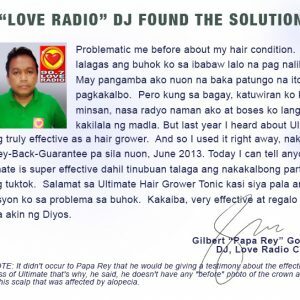 Nagpapasalamat ako sa Diyos at pangalawa sa Ultimate Hair Grower Tonic dahil sa improvement ng hair, umangat at kumapal ang buhok ko. God bless! 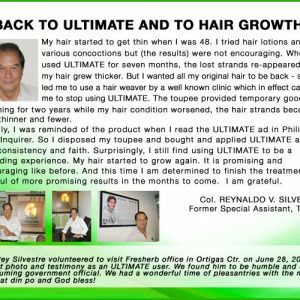 …it’s only now I can say I’m satisfied with the results using ULTIMATE Hair Grower as recommended to me by a beauty parlor. It’s effective and not expensive. I’ve decided to settle with it. 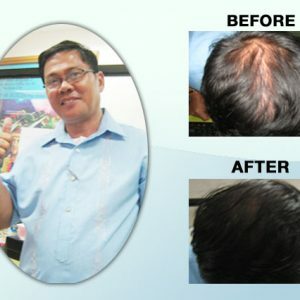 May inalok sa akin ang friend ko na hair grower pero tinanggihan ko ito nung umpisa dahil marami na akong ginamit na treatment sa buhok ko at wala namang nangyari. 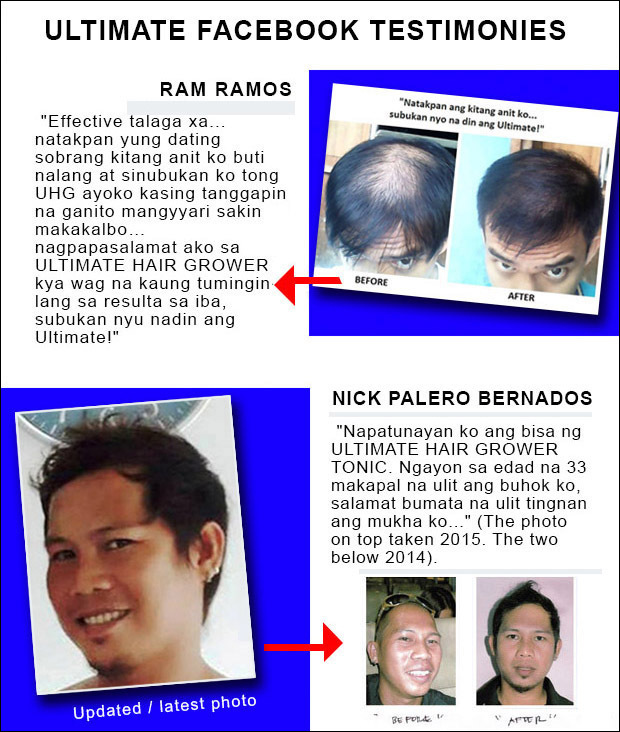 Paliwanag niya, may mga kakilala daw siya na gumamit ng ULTIMATE HAIR GROWER TONIC at effective ang resulta. 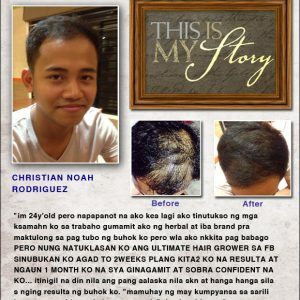 Napag isip-isip ko, ok last na ito na susubukan ko… After two months, may bagong buhok na tumutubo sa anit ko hanggang sa masiyahan ako sa improvement kalaunan. 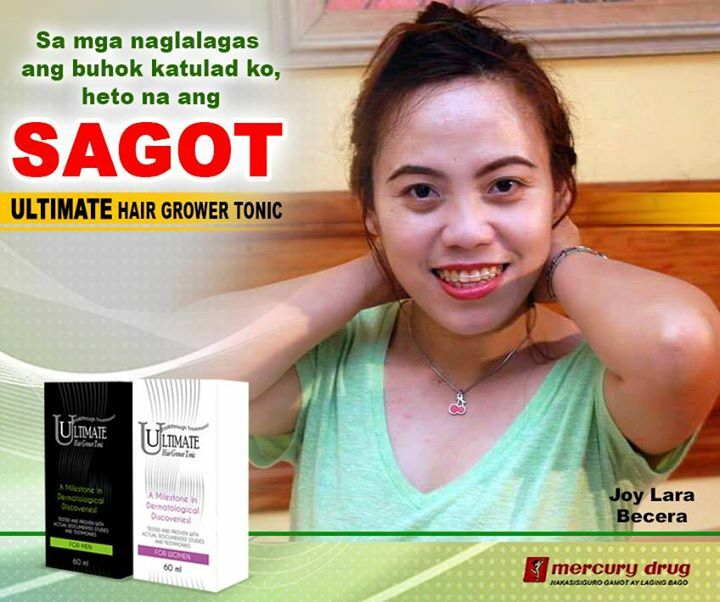 Ngayon tinuloy tuloy ko na ang pag gamit ng Ultimate at higit sa lahat, muli akong nabuhayan ng pag-asa… I suggest sa mga may problema sa paglalagas ng buhok or nakakalbo na, try this one at hindi kayo magsisisi. Thank you, it’s been wonderful! Due to too much stress I had hormonal imbalance. My hair becomes oily and dry at nag falling hair ako, at first gradual then lately lumalala. 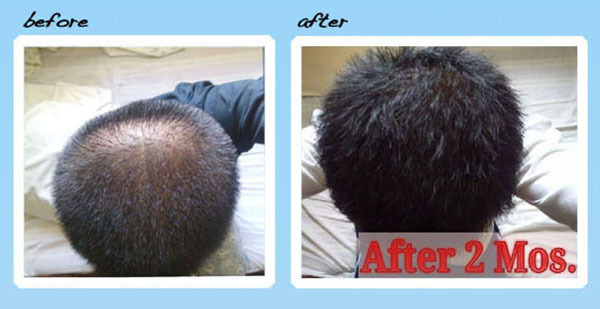 I had to use a certain hair grower which worsen my problem. I was so depressed to see my scalp already visible and shiny. 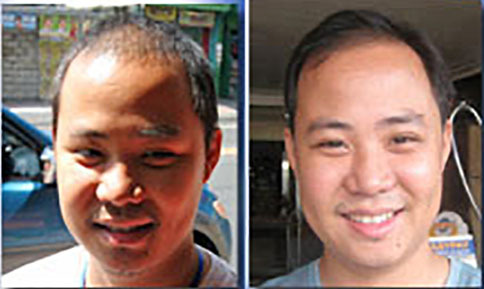 I had to shave my hair 3/4 inch para hindi na ako magsuklay dahil umiiyak ako sa dami ng buhok na nalalagas every time I comb my hair. Then my son found your website. 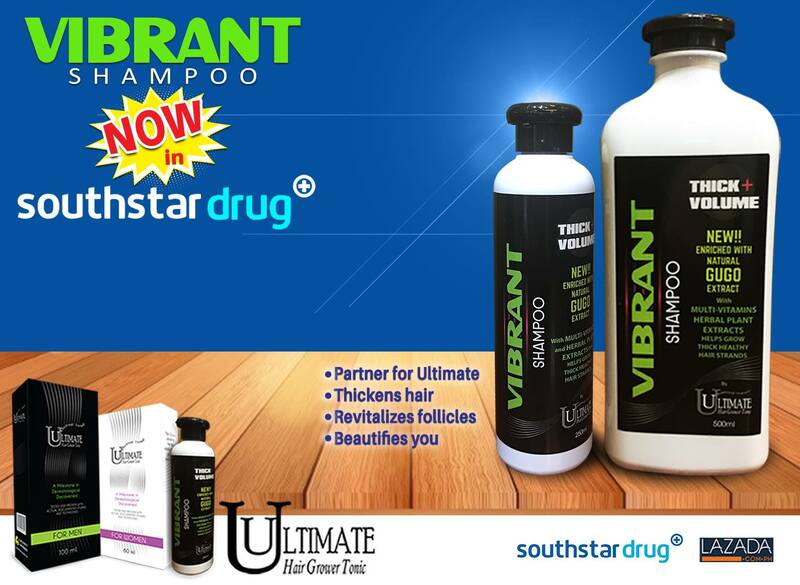 After two weeks pa lang of using Ultimate nuon kaagad nagstop falling hair ko, no more hair on my pillows, no more oily and dry scalp. Actually mas maganda hair ko ngayon and I wake up with a smile and even my palpitation is gone. My hair grows beautifully now. Thanks Ultimate for changing my life. 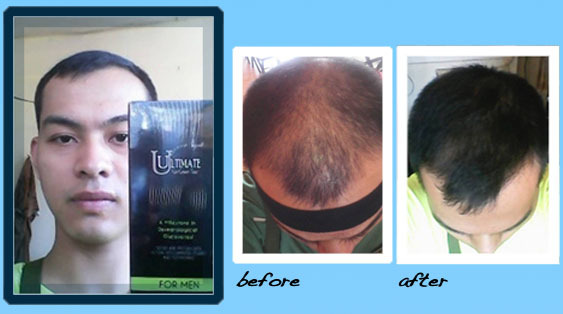 Me and my mom are using Ultimate Hair Grower, and this thing works wonders. 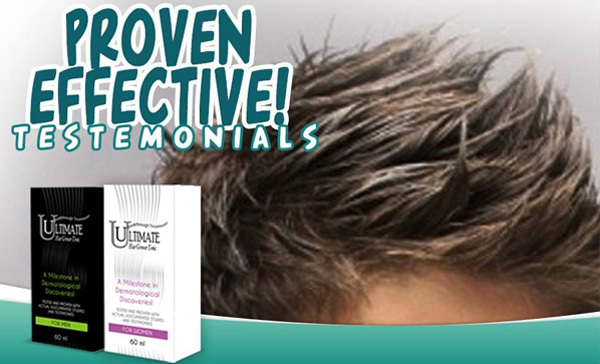 I’ve already prevented further hair loss by using Ultimate. My friends and office mates are already telling me “Your hair is thickening”. We’re both continouosly using UHG up until now and I myself can’t see any reason to stop. Thank You UHG! SO HOT AND SO REAL !!! 1. 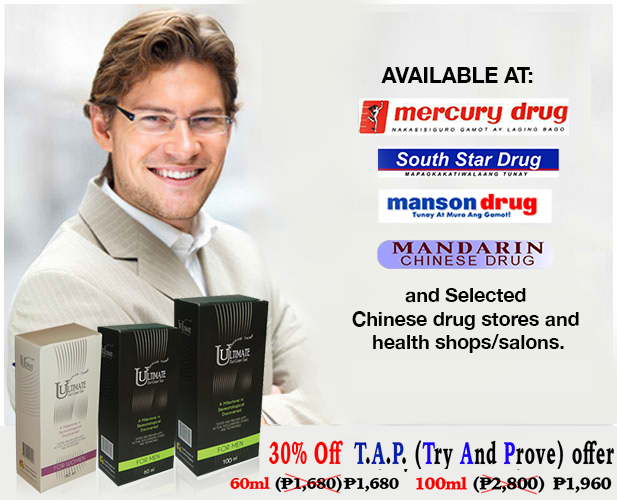 Amir Sanchez – Sa lahat ng ginamit ko, ito nag take effect..salamt po at mgnda ang product..
2. 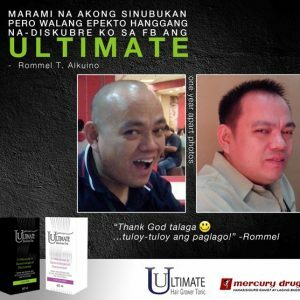 Rani Samonte Balucan – 5 months na po ako gumagamit ng product nyo. Sobrang effective..
3. 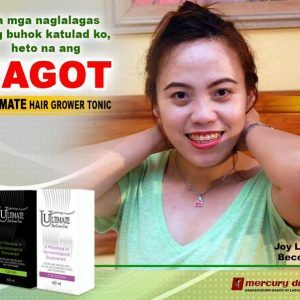 Hiazney Maurer – lubos kong tinatangkilik ang produkto nyu dhil sa bisa nito.. i really love and am amazed of this product.. Lahat po ng photos na sine send ko sa inyu ay pawang katotohanan at walang edit, yan ung before and after ko.. ang sa akin lamang poh ay maiparating ko sa inyu kung gaano aq kasaya nung natuklasan ko ang Ultimate.. binabalik nito ang aking confidence..
4. 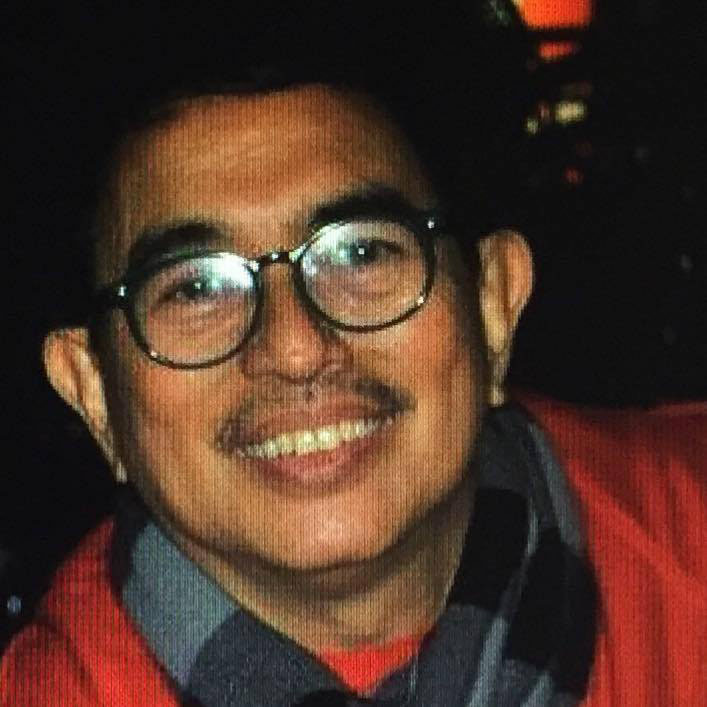 Arnold Majan Palwa – Gumagamit na aq ngaun nito. And it really works. 5. 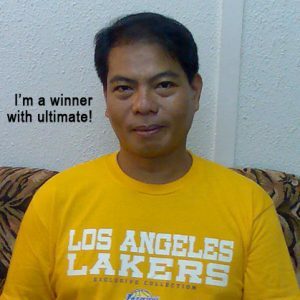 Alvic Malab – Loyal user ako ng uhgt… At malapit ko ng mareach po ang dream and desire ko. To God be the glory po. 6. 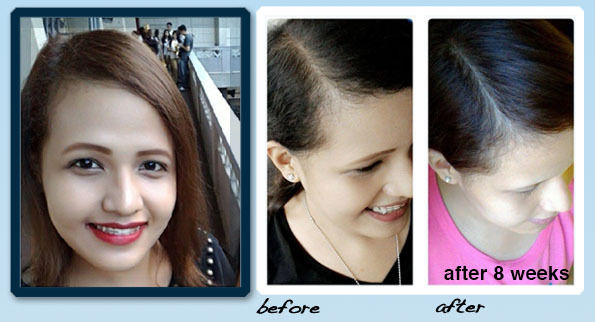 Marie C. Pamintuan – I thank and praise God bcoz I’m happy now I’ve found ultimate hair grower… less hair fall nko, … sinasabi ko Lord ayoko pong makalbo and finally sinagot Niya ako.. thank you so much. 8. 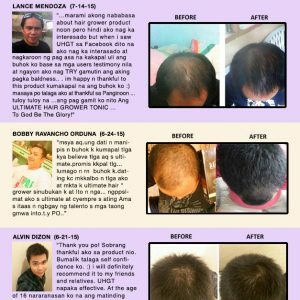 Rommel Teñoso Alkuino – Proven and Tested ko na po ito.. You may visit my timeline para sa before and after photos ko..Godbless! 10. 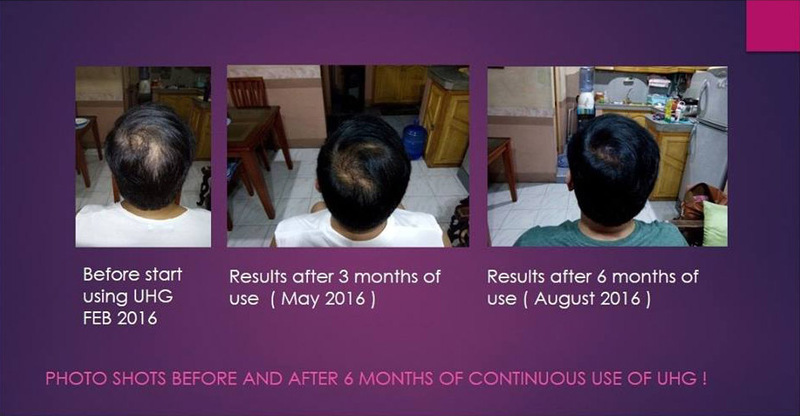 Zep Cubacub – Ako naman kita ko growth ng buhok ko after 2months of use. 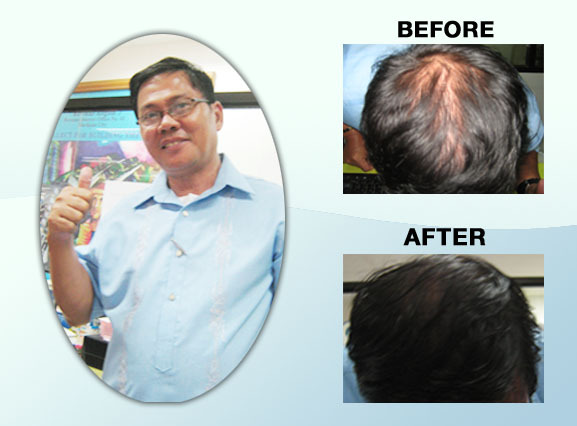 2 weeks pa nga lang mayroon nako napapansin nawala din dandruff ko. 11. Shanesteven Ansong – talo Brand X. 12. 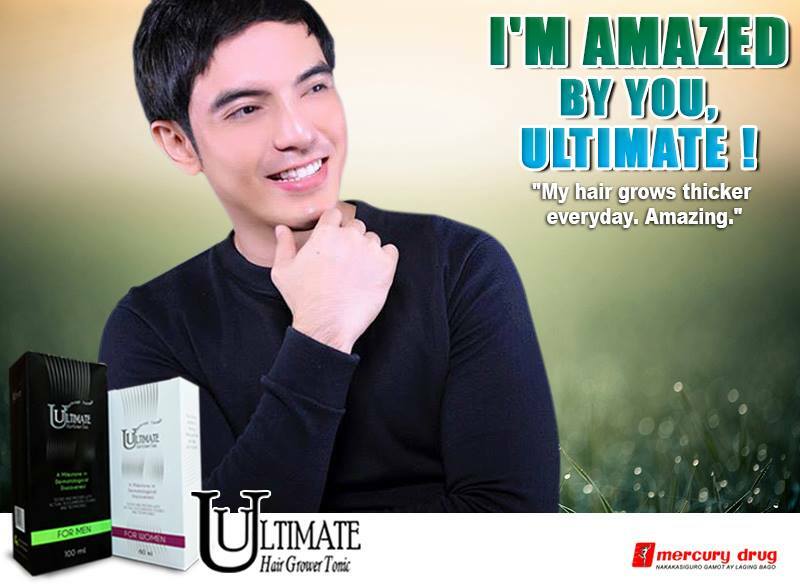 Gerald Vertudes – Thanks ultimate effective ang product nyo. 13. Mark Nel Acojedo – Sayang nasa south korea aq. ganda sna ng promo nio po.. happy aq sa result. 14. Virginia de Ramos – Effective. 15. MharMich Castronuevo Mesiderio – I belive this the best solution .. I already read all testimony in ur site .. Thank you … To God be the glory .. 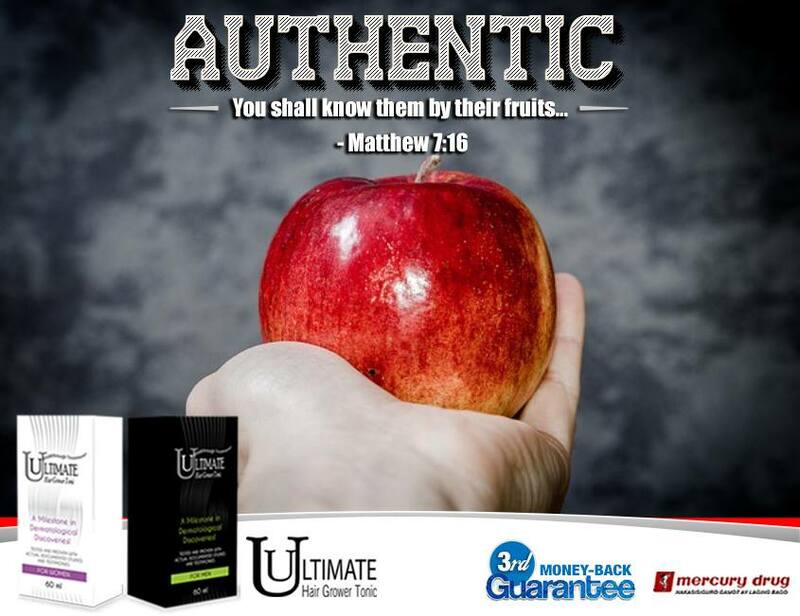 I gave ULTIMATE a try on my self and four months later, having proven it true and effective, I ordered more on COD term, I go around my stores happily serving as a model for ULTIMATE. No wonder my people find it easy to sell the product. 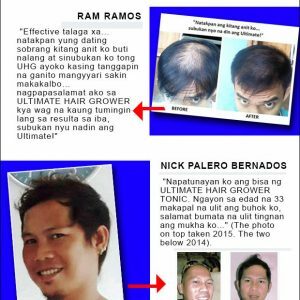 I have spent almost a hundred thousand pesos with little result going to a hair clinic and was told the treatment procedure had to continue which would cost me more money until I saw your “Don’t Wait” ad in Inquirer… I’m getting much better results using Ultimate. And Cheaper! Ok lang with me even if I continue with Ultimate for maintenance although I’m using it consistently for ten months now basta ma-maintain ko and improvement. I’m happy. 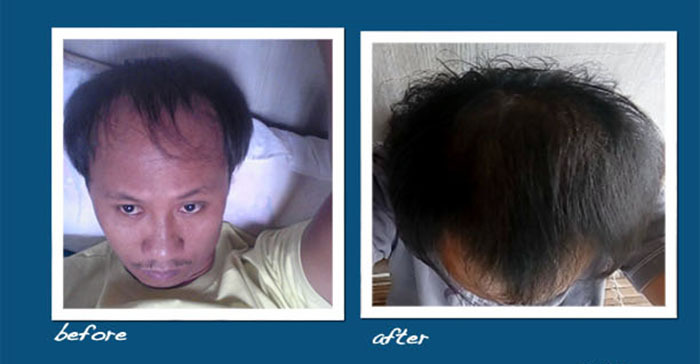 I have been using Ultimate Hair Grower since Feb, result is good, just want to know if it is possible to buy wholesale as in 6 pcs/purchase wd a discount? Thanks you. God bless! 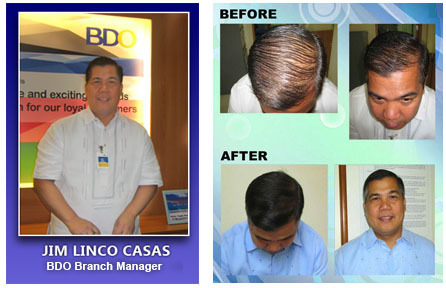 My hair nag thick because of Ultimate Hair Grower, tinubuan and bald spots. Thanks at makapal na uli buhok ko. 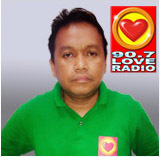 Romeo Cortez, 37 yrs old. Gov’t Emp., Cagayan de Oro. 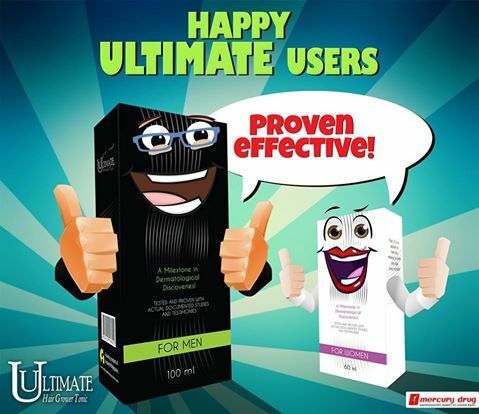 Salamat at kumapal buhok k. Pa2loy aq ggmit ng Ultimate at magttwala. Ultimate worked well with my Korean husband. But may I know if we can get special discount in case we make bulk order so we can bring to South Korea? Elow poh! 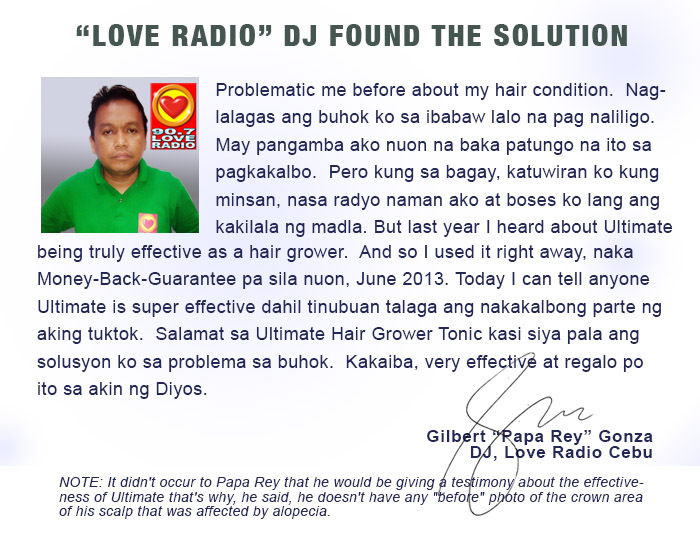 Maganda ang outcome at pagbabago dahil sa paggamit ko ng Ultimate Hair Tonic… mabilis ang recovery. 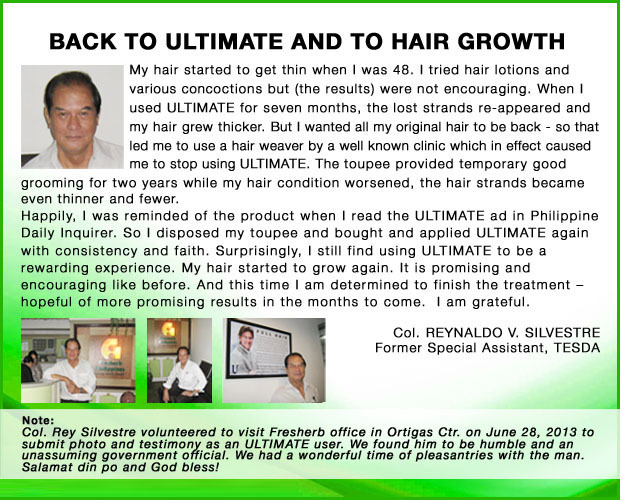 I got results from Ultimate that I didn’t see when I went through sessions of very expensive treatment procedures in hair clinic. 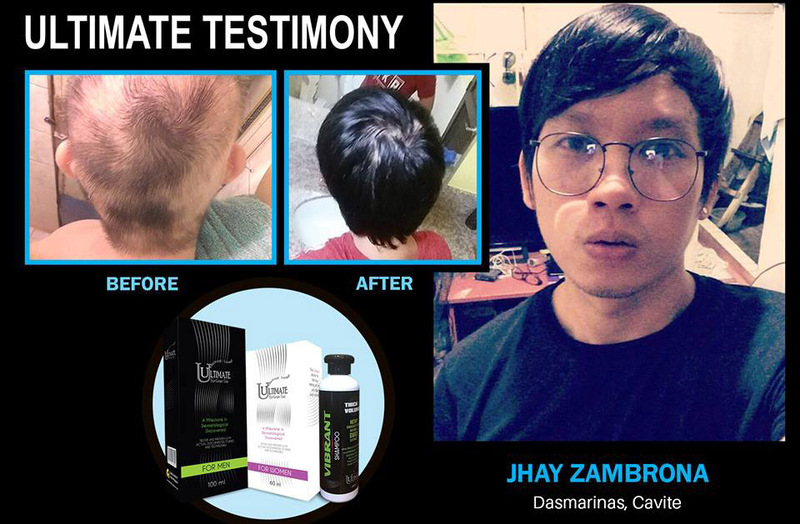 Galing pa sa Canada ang mga ginagamit kong hair grower, padala ng anak ko, pero tila ito lang Ultimate ang umipekto. You gave us hope, people like me, because of your product. Truly effective. Thank you so much. God bless! 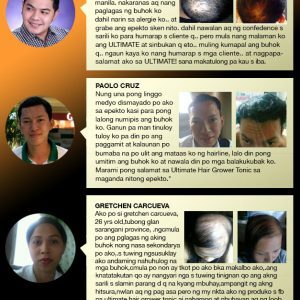 After 8 months of using Ultimate, at last di na malinaw tuktok q, dami nanaubos na para sa doctor, dermatologist, herbal, gamut, sa Ultimate lang pala 22bo buhok. 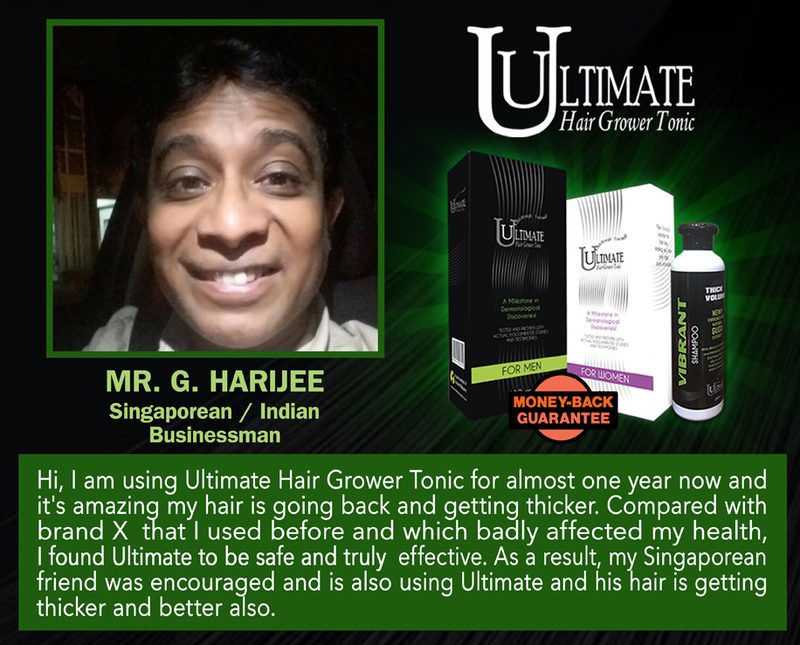 I just bought a bottle of Ultimate Hair Grower the other day upon the insistence of my friend who is using it. I was convinced to try because he showed me his hair and it’s growing after using Ultimate for three months now. 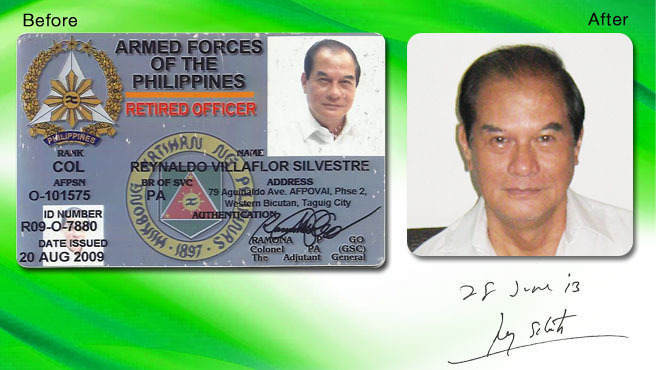 “Pipol say I luk younger & better now. In fact i plan to have a 2nd honeymoon with my wife. ha ha ha…Tnx Ultimate for restoring my hair & turning the clock bk to my age!